Yet another beautiful day in Boston! 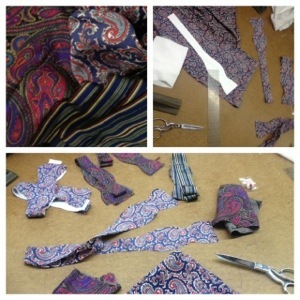 Started with a little bit of tennis then went to the studio to make some more bow ties and pocket squares…. Am I on to something here or what? 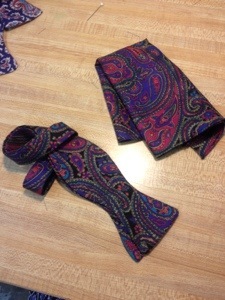 Cut 5 Bow ties and matching Pocket squares….Now I’m ready to sew! I made some mistakes and had to do and re-do a few operations…but the best way to learn in to make mistakes. 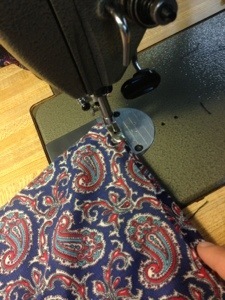 What a pain it is to unsew. And its a waste of time…. As we all know TIME IS MONEY! don’t waste it! 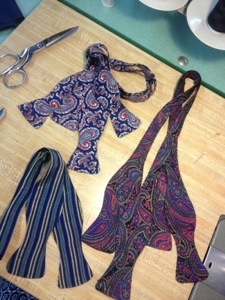 By the 3rd one…I finally got in to a groove and became a bow tie making machine! Again, I’m very excited to see my boys wearing these. A very stylish bunch indeed! Pictures to follow!!! Bow Ties to be worn at various upcoming events around town. I’m working on a couple of dresses….hopefully some day in the near future I’ll be outfitting the ladies at these events too….at the very least I’ll be rocking them!